Japanese Sociology began in 1893 when Tokyo Imperial University (now the University of Tokyo) established the first Department of Sociology in Japan. Today, the Japan Sociological Society (JSS) is one of the largest sociological associations in the world after the American Sociological Association (ASA), with more than 3,700 sociologists. Since its founding in 1924, JSS has held 86 annual conferences, with the most recent boasting more than 1,200 participants. 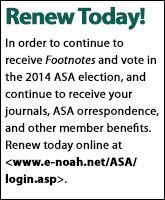 JSS publishes two academic journals—The Japanese Sociological Review, a quarterly journal published in Japanese that has issued more than 250 volumes since 1950, and The International Journal of Japanese Sociology (Wiley-Blackwell), an annual sociological journal published in English since 1992. JSS, the only national sociological association in Japan, maintains close relationships with many regional and sub-disciplinary associations such as the Tohoku Sociological Association and the Japan Society of Family Sociology. We have similar sub-disciplinary associations that focus on regions, cities, villages, environment, mathematical sociology, social pathology, labor, women’s studies, gender studies, welfare, medical treatment, mass communication, sports, and information science and technology, to name a few. These 29 associations established the Japan Consortium for Sociological Society in 2007. Learning from the United States and Germany, Japanese Sociology has had a history of a self-reflexive style of thinking on the modernization processes. Before World War II, sociological research and education in Japan were strongly affected by German Sociology. After the war, American Sociology became the strongest influence on sociology in Japan. Between the 1950s and the mid-70s, under the rapid economic growth of post-war Japan, sociology experienced a remarkable development. Young scholars in Japan rushed to study democratization, modernization, and industrialization, affected mostly by the Chicago School’s empirical research and Talcott Parsons’s theories. During this time, many Japanese sociologists, affected by Marxism and socialism, were strongly reform-oriented with concerns for democratizing society, particularly rural areas, families, and factories. Called “the disobedient generation” in the Japanese context, they experienced student movements and protests against the authorities in the late 1960s. After the mid-1970s, American Sociology had an impact on Japanese Sociology’s shift toward professionalization and specialization within the discipline. A good example is the Social Stratification and Social Mobility Survey in 1975, which focused on the investigation of Japan’s growing new middle class. This shift in Japanese Sociology reflected Japan’s rapid economic growth and nationwide urbanization with declining reformist orientations and socialist ideologies. The mid-1980s was another turning point for sociology in Japan. The baby boomers emerged as key players leading new sociological fields such as feminist sociology, minority studies, environmental sociology, and more. Since then, issues in sociology have further diversified and diffused. Currently, sociologists in Japan are tackling a wide variety of social issues, problems, and phenomena (e.g., low fertility and rapid aging, gender discrimination, non-regular workers, discrimination against ethnic minorities, youth culture, volunteerism and non-profit organizations, protest movements, and globalization). Although some sociologists in Japan are publishing best-selling books for the general audience, others see an identity crisis among Japanese sociologists, asserting that contemporary sociology looks like a treasure chest including everything except the theoretical core of the discipline. Japanese sociologists’ identity crisis is hardly a dilemma, compared to the 2011 triple disasters of an earthquake, tsunami, and the Fukushima nuclear power plant. Since then, sociologists in Japan have created and participated in the network of research and information exchange on the disasters that brought much work to do and new challenges to face. A number of research groups started to conduct surveys in almost every local area that suffered these disasters. What is the role of sociology in a country facing such severe disasters? How should we conduct surveys in these tough situations? How can we create meaningful dialogues with refugees? And, as sociologists, how can we support them? We are confronting many sociological challenges on macro, mezzo, and micro levels. For example, sociologists in Japan are rethinking the relationships among science, technology, and politics; addressing urban planning to rebuild communities; rebuilding the systems of agriculture, farming, and fishing; and creating jobs. Other examples of how sociological research is addressing local issues are supporting and enhancing voluntary and non-governmental organizational activities; providing special care or resources for the elderly, children, the physically and mentally challenged, and immigrants with limited language skills; reuniting separated families escaping from radiation; and caring for isolated refugees. As some problems are addressed, more problems emerge, for instance alcoholism and domestic violence. Many citizens, especially those in Fukushima, are criticizing the electric power company and the Japanese Government, and demanding protection for their families, full compensation for their loss, and cleaning and decontamination of the environment. They hold protests, mass rallies, public lectures, and meetings almost every weekend. Sociologists, too, frequently participate in these discussions. 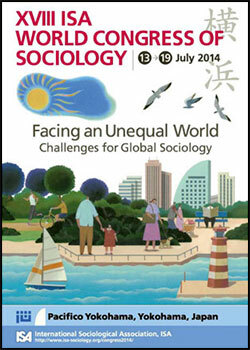 Sociologists in Japan would like to invite attendees to the ISA World Congress, July 13-19 in Yokohama, to join in discussions about the theme, “Facing an Unequal World: Challenges for Global Sociology,” which relates to the issues discussed above. The country with the largest representation of sociologists presenting papers comes from the United States, followed by Japan, Germany, United Kingdom, France, and more (more than 100 countries/areas in total). The Japanese LOC, in particular, provides the following five thematic sessions on the urgent social problems to be addressed in Japan and the world. Speakers and discussants will include globally distinguished specialists (see www.isa-sociology.org/congress2014/thematic-sessions.htm). Natural/Human Disasters and the Recovery of Local Society. Low Fertility, Rapidly Aging Society, and Changing Gender Relations. Civil Society Issues: CSOs, NGOs, Social Movements. Globalization, Migration, and Multi-ethnicity in Asia. New Cultural Waves from Asia. In Yokohama, you will find sessions related to your sociological interest, whatever they might be. You will also experience the most beautiful harbor city in Japan. Come to Yokohama, enjoy the conference and your stay. The Yokohama Congress is yours. For more information see, the ISA Congress Site (www.isa-sociology.org/congress2014/) or the Japanese LOC Site (www.wcs2014.net/en/content/english).